A BIG THANK YOU to those who responded to my request for your favorite meal planning apps! I am so excited to share what has people buzzing when it comes to simplifying the dreaded question of “What’s for dinner?”. THANK YOU to Rochelle Waite who suggested “The Cooking Pot.” This app is only $2.99. It can be used for: iPhone, iPod touch, iPad with iOS 6.0 or later. Cooking Pot by Progressive Aspect Pty Ltd is a recipe organizer, meal planner, and shopping list app for your iOS device. The app helps you pick your recipe, shop, and prepare the meal by providing easy to understand instructions. This app will help people of all cooking backgrounds and budgets: from students on a budget just learning to cook, to foodies who want to expand their cooking horizons. You can choose recipes that take less than 30 minutes to prepare if you’re in a hurry. Why not try out the app and save yourself money on fast food? You’ll probably lose some weight too since you’ll be eating wholesome, nutritious food. You’ll learn to use seasonal ingredients, cook with what you have in your fridge and pantry, and reduce the time you spend in the grocery store. Vegans, vegetarians, and people with allergies and intolerances will find tons of suitable recipes. You can remove unsuitable recipes easily using this app. You get soups, entrees, main course meals, drinks, and desserts in this awesome app! Cooking Pot was released mid-December 2012. THANK YOU to SARAH MORRISON who recommended “Plan To Eat“. This app even gives you a FREE 30-Day trial. Shopping Lists On The Go: The mobile site provides a phone-ready shopping list that is easy for you to view on your phone as you shop. Check Off Items As You Go: Tap the check-box next to each item as you add them to your cart. Once you check them off, they will be grayed out, or use the Hide Checked Items feature to remove them completely from the list. Add Additional Items: Add additional items to your shopping list from your phone so that you don’t have to try to remember them until you get home! View Purchased Items in Your Pantry Inventory: When you check an item off on your mobile shopping list, it is automatically moved to your Pantry Inventory on the main site. From there, you can see which items you’ve purchased and when they were purchased. View Recipes on Your Phone: Access your recipe book and pull up individual recipes right on your phone. Refer to recipes while at the grocery store or even while you’re in the kitchen preparing them so your recipe book is always with you. 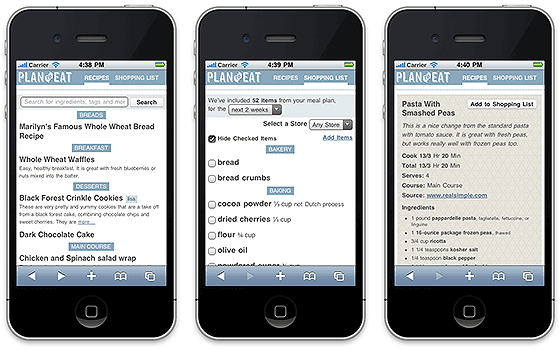 What is your favorite app to simplify meal planning and cooking?